Deer flies are commonly found throughout most of the United States and are known for their fierce bite and agonizing wounds that can last for days. Deer flies flourish around cattle and love to feed upon the blood of horses, cows, mules, hogs, deer and pretty much any warm blooded mammal. For this reason, they can be a problem for man as well. A deer fly biting the arm of the photographer. 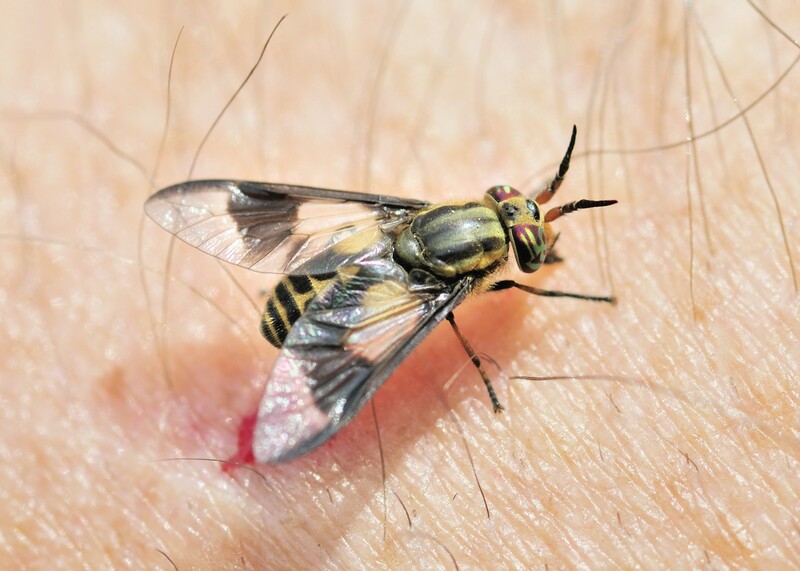 Deer flies are active during the warm summer months. Eggs hatch and thrive around water and moist vegetation where they feed upon anything organic. This feeding can go on a long time compared to most flies and the larval stage may take 1-2 months or as long as 3 years before they pupate into adults. Compared to common filth flies, this is an eternity. The real problem with deer flies is the adult stage. Once pupae have fully matured and molted to the biting adult fly, they’ll hatch and seek anything warm blooded on which to feed. Most active during the warmest time of the day, deer flies will find any animal out in the open field, along stream beds or in the yard. When they spot a likely target, they’ll typically fly around a the head first looking for any chance to land and start sucking a warm and nutritious blood meal. Swatting at them might get them to leave but they’re usually quite persistent and will many times return over and over again. At some point their return will go unnoticed. This is when they’ll land and take a bite which in turn can leave a large, swollen hive-like mark that can itch for days. If you’re going afield and expect to encounter deer flies, bring STING RELIEF SWABS. Bites should be treated with these swabs as soon as possible. Relief Swabs will offer soothing relief to the area and help minimize the impact of nasty deer fly bites. Deer flies can be repelled effectively with two forms of deet. We have this formulation in both a straight, 100% DEET strength but for many users, the DEET 20% LOTION works longer. The 100% is no doubt the strongest formulation available but the lotion might be better suited for many uses since it tends to “stick” longer on the skin. This is especially helpful when its hot and you find yourself sweating a lot. You can also repel deer flies with PERMETHRIN AEROSOL. Simply spray down your clothing the morning of the day you’ll be outside and treatments will usually last 4-8 hours. Another great way to repel deer flies is to wear a hat. Misting any cap or hat with this same permethrin aerosol once or twice a day when outside can really help repel them since they tend to focus on the head area. Permethrin is odorless to people but flies will readily detect it’s presence and hate being around it. And if they do land on treated surfaces, they’ll die. Since deer flies will lay eggs close to water, it’s hard to treat the standing ponds, streams, rivers and other wetlands they’ll use. Traditional pesticides cannot be used in these areas but recently there was a product granted federal exemption for use over water. Made from food and plant essential oils, ESSENTRIA IC can be safely applied around shrubbery, vegetation and open water like ponds, lakes, streams, stagnant pools, marshy areas and ocean shoreline. We have seen great results using Essentria at the rate of 4 oz per gallon of water when applied using one of the mist blowers below. This active will kill developing larvae so if you have any water on your property, be sure to focus treatments in these areas. Using a mist blower will ensure you get all foliage covered so foraging adults can’t hide and you’ll use a lot less product compared to spraying a liquid. For example, it typically takes 30-40 gallons of mixed solution to liquid spray an acre but using a mist blower, you can do the same area with just 2-3 gallons. Expect treatments to last 10-14 days though you can reapply Essentria as needed. For smaller pests like Noseeums or mosquitoes, you may find treating every 7-10 days yields the desired results. But with Deer Flies, you will get longer protection. That being said, its also more important to treat as large of an area as you can cover. Deer flies will travel great distances to find a meal so to keep them out of your range, cover as much of the property as you can reasonably manage. Essentria can be applied as a liquid but you’ll be best served using a fogging machine. For most properties up to an acre, our FM6309 will do the job. 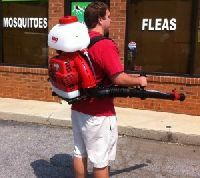 It has a 1 gallon holding tank and can project the mist 30-40 feet. Plan on using 1 gallon per 1/4-1/2 acre. This machine requires electricity so if you want to avoid dragging around electric lines, consider a MIST BLOWER. These units run on gas, have 3+ gallon holding tanks and will serve double duty as a leaf blower. Our entry level model will project the mist 30-40 feet and enables you to walk acres without being tethered to an electric cord. You should still plan on applying 2-3 gallons of mixed solution per acre but these can be set on a golf cart or other ATV for faster mobility around the property. 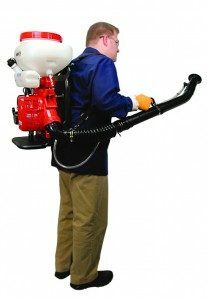 Our best MIST BLOWER is a little more powerful, quieter and lot more comfortable to wear so if you will be treating on a regular basis covering several acres, consider this model over the entry level. Overall it will be easy to manage and maintain but regardless of which unit you get, either model can handle 1-3 acres for any pest. Keep in mind the reason these treatments work so well for pests like deer flies, horse flies, etc. is because the mist (when applied thoroughly) will permeate and cover dense vegetation 2-3 times as well compared to a liquid. This insures you’ll reach the feeding larval stages which is critical for long term deer fly management. Adult flies will commonly travel 1/2 to 1 full acre to find food so again, try to reach as large of an area as possible with the Essentria. 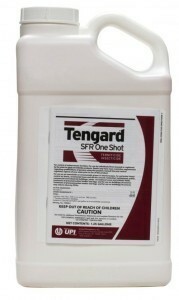 If you’d like to try something a bit stronger than Essentria, PERMETHRIN SFR will provide longer lasting residual. Keep in mind you can’t use this over streams, ponds, lakes or rivers but its fine for all other areas. Basically it will give you more residual action so you won’t need to apply it nearly as frequently compared to Essentria. For deer flies, add 1 oz per gallon of water and like the Essentria, plan on using 2-3 gallons per acre. 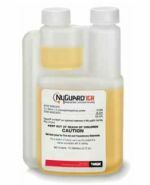 And for even longer lasting residual action, add NYGUARD to the mix. This “egg killing” growth regulator will effectively stop eggs from becoming adults. It won’t kill them (neither will the Essentria or Permethrin) but it will over expose them to hormone used in their growth. This overexposure causes them to get deformed and die before becoming a normal adult. Nyguard applied to the landscape can last 60-90 days so it will effectively outlast the adulticides. This in turn can take away vital reproducing areas which in turn will put an end to the life cycle on your property. Since deer flies can take years to fully develop, deer fly management and treatments should be done on a regular basis once deer fly season starts. Keep in mind deer fly season will start long before you start seeing adults. Typically the season runs from March to October in the southern states; May to September in the northern regions of the United States. To effectively control deer flies for the long term, you’ll need to start misting before you see them and treat at least once a month during these months. Twice a month is even better and if you also want to reduce or eliminate biting midges, mosquitoes, gnats and other flies, the twice a month routine is the way to go using Essentria or Permethrin. A lot of good info on this site. We have a big problem with biting flys in northern wi. I used to use sawyers broad spectrum because worked. Now I can no longer find it. Did they stop making it? If so, why? Is there another product that works as well for flys? Please advise. Sawyers is constantly changing their packaging/mixtures so its hard to say why since they don’t generally let us know. Typically we don’t know something is no longer available until we go to order some. And by then, the reason is many times lost or forgotten. In most cases it has to do with lack of sales. As for the broad spectrum formulation; I do remember this item and if I remember right, they discontinued it two years ago. Why? I have no idea. Regardless, our big seller for biting flies up your way is a deet formulation we carry which includes a synergist. This combo has proven to work very well up north and I’m sure it will work on deer flies, horse flies and in general, any kind of biting fly you may encounter afield. This is based on having sold it for many years and what our customers have to say about it. Mind you deet by itself is not too good for flies. But when the synergist is added, things really change and it does well.